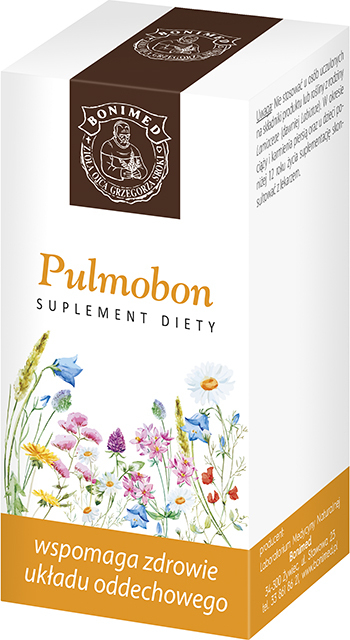 Because the product contains linden inflorescence, which causes stimulation of perspiration, Pulmobon supports the body’s natural defense during cold. Because the product contains thyme herb, it soothes the throat and the respiratory tract, and it also supports the body’s natural defense mechanisms. Because of English plantain leaf contents, the product soothes the throat, and supports the immune system. Ingredients: English plantain extract, linden extract, thyme herb, bulking agent (maltodextrin), anti-caking agent (magnesium stearate, silicon dioxide), gelatin (coating). Recommended daily intake of the product (3 capsules) contains: English plantain extract 600 mg, linden inflorescence extract 270 mg, thyme herb 210 mg. Recommended intake: Take 1 capsule 2–3 times per day. Dietary supplements should not be treated as a substitute (replacement) of a varied diet. Do not exceed recommended daily intake during the day. Contraindications: Don’t use it if you are allergic to the product ingredients. Taking the product by children is not recommended. If you are pregnant or breastfeeding, talk to your doctor first.